Son Goku's first name, this "Go" kanji, is worn by this famed hero of the Dragon Ball Z series. Meaning "wisdom," you too can show off your own wisdom and appreciation for Goku and Dragon Ball. 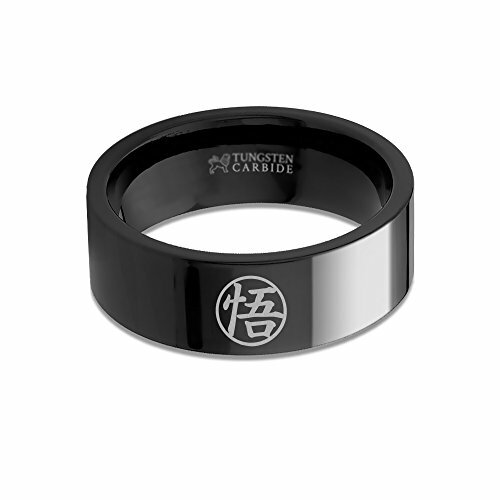 Engraved by a high-power laser, Goku's name symbol is featured on a meticulously crafted black tungsten carbide ring brought to you by Hanover Jewelers. The perfect tungsten carbide wedding band or engagement ring in a polished finish for that special someone. Features: flat surface with pipe cut edges, laser engraving, black ion plating. Thickness: 1.5 mm - 2.3 mm. Weight: 3 - 16 grams. Also available in: 6 mm, 8 mm. Shop with confidence: all rings sold by Hanover Jewelers are backed by an industry-leading lifetime warranty policy and lifetime resizing guarantee. If you have any questions about this product by Hanover Jewelers, contact us by completing and submitting the form below. If you are looking for a specif part number, please include it with your message.